As a fund raising vehicle, crowdfunding is still in the do it yourself phase of evolution. The current model is inadequate; once a project goes live on a crowdfunding portal like Kickstarter, the project creator is on its own with little to no marketing support. Many campaigns fail to reach their goal. Crowdfunding can take lessons from the investment banking model by adopting two mechanics that make fund raising more efficient: syndication and marketing. If crowdfunding portals acted like investment banks, they would form syndicates to collaboratively raise money that, at closing, would be pooled into one lump sum. The project creator raises more money, each syndicate partner takes their cut, and, in theory, everybody wins. To make their cut, syndicate partners are incentivized to actively market the campaign to their dedicated client base, and achieve a much higher close rate than say, a cold solicitation of a Facebook ad that many current crowdfunders resort to. Unfortunately, crowdfunding portals have no reason to collaborate because they don’t provide any marketing benefits to a campaign, and would cannibalize each other. The final piece of marketing is deal exposure. Investment banks work together with business media to make sure their deal is covered by analysts and reporters. They do the dog and pony shows from city to city to market the deal down to the community level. What’s missing from the current crowdfunding model is the ability to reach local levels where word of mouth and personal connection marketing can truly happen. I call the next phase “collaborative crowdfunding” because it will mobilize the groups and organizations that share the values of a campaign and give them tangible incentives to actively support it. This alliance is the new “syndicate”. National exposure is done by branding the campaign with a specific hashtag (similar to how brands use hashtags during SuperBowl), and getting the syndicate to market the hashtag across the social media, particularly Twitter. Kickstarter raised more money for artists in 2012 than the National Endowment for the Arts. As funding for arts projects moves towards crowdsourcing, the needs of artists and museums remain the same. Artists need exhibition space, more money to live on, and ways to continue to build their brand by exposing their art. Museums need funding sources, marketing budgets, and ways to show their communities of local patrons and the artists themselves how they contribute to them. Since the mutual need of the artist and the museum is to stage a successful exhibition, collaborative crowdfunding can market and fund an exhibition that engages the audience both are after: the local art lover. The Infinity Boxes is a typical crowdfunding campaign of a social art exhibit with two distinct differences. First, it resides on its own domain name theinfinityboxes.com, not a Kickstarter like portal. 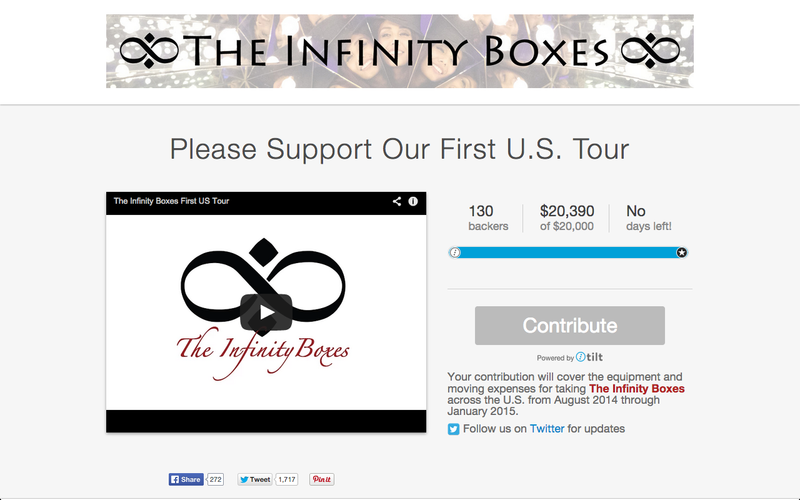 Collaborative crowdfunding requires a permanent site to maintain continuity for serial campaigns; The Infinity Boxes uses the white label Crowdtilt Open platform. Second, this is the principal campaign site to capture backers for The Infinity Boxes; there are separate, parallel campaigns run by the museums that fundraise to bring The Infinity Boxes to their venue. 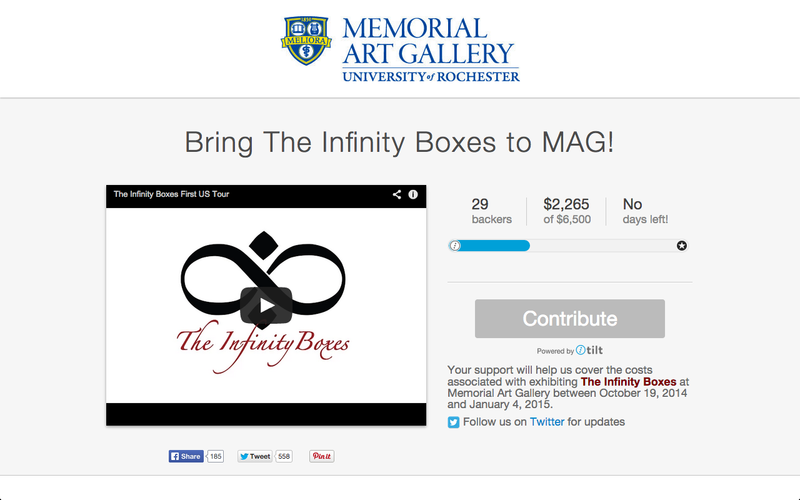 Memorial Art Gallery of the University of Rochester (“MAG”) is the first in a series of museums launching a collaborative crowdfunding campaign to support the expenses associated with staging their Infinity Boxes exhibition. The proceeds of the MAG campaign up to the target amount are used to cover the artist’s expenses, any surplus is earmarked for the museum’s curatorial expenses, which motivate the museum marketing staff to raise as much as possible. The video and content for the Museum campaign simply borrows from the artist’s master campaign because it tells the artist’s story direct to the MAG’s backers. It makes it simple for museums to collaborate, museum’s only need to add specific collateral and rewards to their campaign. The artist benefits simply by getting their exhibitions funded directly from museums’ crowdsourcing to their membership. Collaborating museums act as the new syndicate to engage local backers who would be inaccessible to the project if the museums were not involved. What are the museums’ benefits from collaborative crowdfunding? 1. Marketing the Exhibition. Crowdfunding acts to pre-market the exhibition and engage the museum’s member base. Museums can offer a different set of crowdfunding rewards to spur pre-sales, like $10 for two exhibition admissions or $50 for an annual membership. 2. Local media coverage. The campaign, managed by BNN Funding, leverages The Breaking News Network (“ BNN”), the most comprehensive local media network supporting social good, covering over 400 cities worldwide. As a community service, the BNN gives the museum a local media voice from its Rochester city feed to expose the campaign locally. The BNN acts as a media syndicate partner for museum campaigns. @RochesterNYBuzz amplifies all Memorial Art Gallery (@magur) tweets whenever the hashtag #infinityboxes or #rochester are included in the tweet. 3. National branding of museum as an institution that supports artists. When a museum uses its resources to fundraise for its artists, it is a compelling show of support for the artist’s work. The combination of innovation, artistic collaboration and active marketing support associated with collaborative crowdfunding can elevate a museum’s standing with the larger artist community. The BNN recognizes the museum’s innovation and good will nationally by exposing the project through media to artists across 350 cities. 4. Fundraising. Although the marketing benefits of crowdfunding are powerful for exposure and branding, receiving the check is the cherry on top. Collaborative crowdfunding turns the concepts of marketing on its head by turning expenses into revenues. Collaborative crowdfunding is a serial activity, not a one-off Kickstarter type campaign, that should become a natural strategy for artist sustainability. The master plan for the artist behind The Infinity Boxes is to continue to run campaigns and schedule the exhibit with museums and events producers through future calendar years, and to eventually run new campaigns to support other projects. Serial crowdfunding becomes sustainable with each new campaign as artists and museums validate this new idea of collaborating for a mutual goal. As they all learn to work together, larger blocs of museums (50? 100?) can rally to support even bigger campaigns and issues facing the arts world that could supplement or replace traditional foundation funding. That’s how next phases happen. A unique #crowdfunding platform that syndicates campaigns across 350 cities, with #advocate marketing support in each city.